We appreciate the ongoing feedback we receive from new and long-time users. Thanks to all of the great suggestions we've received lately, we're happy to roll out a number of highly-requested features -- say hello to local backups, smart swimlane diagrams, and a Venn diagram maker! 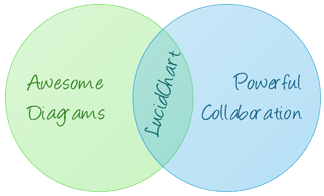 Securing and protecting the data in Lucidchart is one of our top priorities. As a result, we have implemented a very robust backup process with hourly backups stored across multiple data centers. Nevertheless, we understand that many companies require on-site backups. To satisfy these requirements, all users on a Basic, Pro or Team account can now download a backup of your documents at any time. If you are on a Free account and would like to use this functionality, please consider upgrading. By using the right-click menu, you can also re-order swimlanes (move up/down, right/left). Whenever you move, rotate or re-order the swimlanes, all of the objects in the lanes will dynamically respond to keep your diagram looking sharp! These changes are in place for new diagrams but will not affect existing diagrams. While it’s always been possible to make Venn diagrams in Lucidchart, we’ve made it easier than ever by introducing a new shape library. The library contains 16 shapes with pre-set colors and gradients so that you can quickly drag on the shapes and simply add text. Try out the new Venn Diagram shape library here or use the “Manage Library” button in the toolbox to find it later. We hope you enjoy these new features. As always, we look forward to hearing from you if you have any questions, feature suggestions or feedback. Thanks again for using Lucidchart!